For other places named Westphalia, see Westphalia (disambiguation). Location of Westphalia in Germany. Westphalia in the state of North Rhine-Westphalia borders on the Northern Rhineland in the west and Lippe in the northeast. 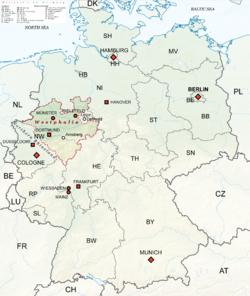 Westphalia (/wɛstˈfeɪliə/; German: Westfalen [vɛstˈfaːlən]; Low German: Westfalen [vεs(t)'fɔːln̩]) is a region in northwestern Germany and one of the three historic parts of the state of North Rhine-Westphalia. It has an area of 20,208 km2 (7,802 sq mi) and 7.9 million inhabitants. The region is almost identical to the Province of Westphalia, which was a part of the Kingdom of Prussia from 1815 to 1918 and the Free State of Prussia from 1918 to 1946. In 1946, Westphalia merged with the Northern Rhineland, another former part of Prussia, to form the newly created state of North Rhine-Westphalia. In 1947, the state with its two historic parts was joined by a third one: Lippe, a former principality and free state. All of the seventeen districts and nine independent cities of Westphalia and Lippe's only district are members of the Westphalia-Lippe Regional Association (Landschaftsverband Westfalen-Lippe). Previous to the formation of Westphalia as a province of Prussia and later state part of North Rhine-Westphalia, the term "Westphalia" was applied to different territories of different sizes such as a part of the ancient Duchy of Saxony, the Duchy of Westphalia or the Kingdom of Westphalia. The Westphalian language, a variant of the German language, spreads beyond Westphalia's borders into southwestern Lower Saxony and northwestern Hesse. Being a part of the North German Plain, most of Westphalia's north is flat. In the south the German Central Uplands emerge. Westphalia is divided into the following landscapes. Westphalia is roughly the region in between the rivers Rhine and Weser, located both north and south of the Ruhr River. Other important rivers are the Ems and the Lippe. The Langenberg (843 m (2,766 ft)) and the Kahler Asten (842 m (2,762 ft)) in the Sauerland part of the Rothaar Mountains are Westphalia's and also North Rhine-Westphalia's highest mountains. The term "Westphalia" contrasts with the much less used term "Eastphalia", which roughly covers the southeastern part of the present-day state of Lower Saxony, western Saxony-Anhalt and northern Thuringia. Westphalia is divided into three governmental districts. These are subdivided into further districts and independent cities. All districts and independent cities of the governmental districts of Arnsberg and Münster are considered to be a part of Westphalia as a historic region. The District of Lippe as successor of the Free State of Lippe in the Governmental District of Detmold is rather considered to be a separate historic region. The traditional symbol of Westphalia is the Westphalian Steed: a white horse on a red field. It is derived from the Saxon Steed in the coat of arms of the medieval Duchy of Saxony which most of today's Westphalia was part of. In official contexts the coat of arms of Westphalia is being used by the Westphalia-Lippe Regional Association, which represents these two historic parts of North Rhine-Westphalia. The coat of arms of North Rhine-Westphalia uses the Westphalian Steed to represent Westphalia as one of its parts alongside the Lippish Rose representing Lippe and the Rhine River representing the Northern Rhineland. Prussia already used the Westphalian Steed in the coat of arms of its Province of Westphalia. The coat of arms of Lower Saxony uses a different version of the Saxon Steed since the state also covers large parts of the Old Saxons' duchy. The colors of Westphalia are white and red. The flag of the Westphalia-Lippe Regional Association uses these colors with the Westphalian coat of arms in its center. The flag of North Rhine-Westphalia is a combination of the Northern Rhineland's colors green/white and the Westphalian white/red. The flag of the Prussian Province of Westphalia already displayed the colors white and red. The flag of Lower Saxony shows the colors of Germany and the Saxon Steed. Composed in Iserlohn in 1886 by Emil Rittershaus, the Westfalenlied is an unofficial anthem of Westphalia. Dialects in North Rhine-Westphalia: Franconian dialects in red, West Low German dialects in blue. While the Northern Rhineland, Westphalia and Lippe are different historic territories of today's North Rhine-Westphalia, the old border between the former Rhine Province and the Province of Westphalia is also a language border. While in Westphalia and Lippe, people tend to speak West Low German dialects and especially the Westphalian variant of the Low German language, Central German and Low Franconian dialects are being spoken in the Northern Rhineland. These different regional identities are often being emphasized by different majorities of denomination between Roman Catholics and Lutheran Protestants. The different majorities date back to the days of the territorial fragmentation of the Holy Roman Empire (of the German Nation) which existed until 1806. The Münsterland and the region around Paderborn for instance are still mainly Catholic regions because of the former existence of the prince-bishoprics of Münster and Paderborn. The mainly Lutheran Lippe was even able to retain its independence as a small state within Germany in the form of a principality until 1918 and as a free state until 1946. This continues to influence the identity of its people who often distinguish themselves from neighboring regions such as East Westphalia. In addition to these historic, lingual and religious aspects, there are some regional differences in culture and mentality. That is why many of the citizens of North Rhine-Westphalia rather see themselves either as "Rhinelanders", "Westphalians" or "Lippers" rather than as "North Rhine-Westphalians". It is one of the regions that were part of all incarnations of the German state since the Early Middle Ages: the Holy Roman Empire, the Confederation of the Rhine, the German Confederation, the North German Confederation, the German Empire, the Weimar Republic and National Socialist Germany. After World War II it was a part of the British occupation zone which merged with the American zone to become the Bizone in 1947 and again merged with the French zone to become the Trizone in 1948. The current Federal Republic of Germany was founded on these territories making Westphalia a part of West Germany. It is a part of united Germany since 1990. Around 1 A.D. there were numerous incursions through Westphalia and perhaps even some permanent Roman or Romanized settlements. The Battle of the Teutoburg Forest took place near Osnabrück, which at this time was a place of settlement of the Westphalians, who were a part of the Germanic tribe of the Saxons. Some of the tribes who fought at this battle came from the area of Westphalia. Charlemagne is thought to have spent considerable time in Paderborn and nearby parts. His Saxon Wars also partly took place in what is thought of as Westphalia today. Popular legends link his adversary Widukind to places near Detmold, Bielefeld, Lemgo, Osnabrück and other places in Westphalia. Widukind was buried in Enger, which is also a subject of a legend. Along with Eastphalia, Angria and Nordalbingia, Westphalia (Westfalahi) was originally a district of the Duchy of Saxony. At the time, large portions of its territory in the north lay in what today is Lower Saxony. Following the deposition of the Saxon duke Henry the Lion in 1180 and the subsequent belittlement of the duchy, Westphalia was elevated to a duchy in its own right by Emperor Barbarossa. The Duchy of Westphalia comprised only a small area south of the Lippe River. Modern Westphalia was a part of the Lower Rhenish–Westphalian Circle of the Holy Roman Empire, which comprised territories of Lower Lorraine, Frisia and parts of the former Duchy of Saxony. As a result of the Protestant Reformation, there was no dominant religion in Westphalia. Roman Catholicism and Lutheranism were on a relatively equal footing. Lutheranism was strong in the eastern and northern parts with numerous free churches. Münster and especially Paderborn were considered to be Catholic. Osnabrück was divided almost equally between Catholicism and Protestantism. Parts of Westphalia came under Brandenburg-Prussian control during the 17th and 18th centuries, but most of it remained divided by duchies and other areas of feudal power. 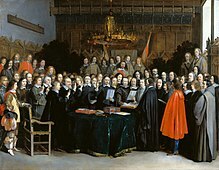 The Peace of Westphalia of 1648, signed in Münster and Osnabrück, ended the Thirty Years' War. The concept of nation-state sovereignty resulting from the treaty became known as "Westphalian sovereignty". Prussian Westphalia edged in red, the Kingdom of Westphalia edged in green with the territorial overlap of former Minden-Ravensberg, pasted over today's borders with North Rhine-Westphalia in dark grey. After the defeat of the Prussian Army by the French at the Battle of Jena–Auerstedt, the Treaty of Tilsit in 1807 made the easternmost portion of today's Westphalia part of the French client Kingdom of Westphalia until 1813. While this state shared its name with the historical region, it only contained a relatively small part of Westphalia, rather consisting of mostly Hessian and Eastphalian regions. Following to the Congress of Vienna, Prussia received a large amount of territories in the Westphalian region and created the Province of Westphalia in 1815. After in 1816, the former Duchy of Westphalia and the counties of Wittgenstein and in 1851 the condominium of Lippstadt had joined the province, Westphalia had received its modern territorial shape. In 1816, the governmental districts of Arnsberg, Minden and Münster were created. After World War II in 1946, the present state of North Rhine-Westphalia was created by the British military government from the former Prussian Province of Westphalia and the northern half of the former Prussian Rhine Province. The old governmental districts of 1816 stayed in place. When in 1947 the former Free State of Lippe with its capital Detmold joined North Rhine-Westphalia, the "Governmental District of Minden" was enlarged by this territory and renamed "Governmental District of Detmold". In total, North Rhine-Westphalia is subdivided into five governmental districts (Regierungsbezirke). Westphalia today consists of the old governmental districts of Arnsberg and Münster and of Detmold except of the District of Lippe which is a separate historical region and state part of North Rhine-Westphalia. Inhabitants of the region call themselves Westphalians and their home region Westphalia even though there is no administrative division by that name. Westphalia is home to the headquarters of Westfalia-Werke, the contractor that built the Volkswagen Westfalia Campers. Candide: The protagonist of Voltaire's novella of the same name, resides in Westphalia in the beginning of the story. Monty Python's Flying Circus – Series 4, Episode 3 – includes a sketch that discusses a questionable map showing a Basingstoke in Westphalia (as opposed to the better-known Basingstoke in south-central England). ^ RP online: Jeder kennt Westfalen — gibt es auch Ostfalen? Wikimedia Commons has media related to Westphalia.